Ecolive support organic producers in their development. Ecolive has been seeking culinary gens since 2010, and supports producers from farm to fork, throughout their development. Constantly seeking exceptional products in total respect of the environment with products which are 100% organic. ECOLIVE is the brainchild of two childhood friends, who love good, organic and, more importantly, healthy food! 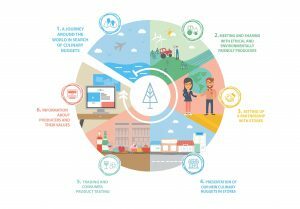 The project aims at assisting organic producers to develop thanks to the tools we offer (meetings in shops, communicating with consumers, tasting sessions in retail outlets, etc.) at low cost compared to internal investment. “For 9 years, we have travelled, searched and worked with organic producers and ensured that wonderful brands (such as Pukka, Farm Brothers, Pakka, Bio Verde, Les recettes de Céliane, Phare d’Eckmühl, etc.) gain in visibility in organic stores such as Biocoop, Naturalia, La vie Claire,, Alnatura, Super Bio Markt, Ebl Naturkost , as well as independent organic stores and groceries. In 2019, our team has 14 people who work on a daily basis to increase accessibility to these wonderful brands by the general public, which come from our organic producers. What makes ECOLIVE products so authentic? Many food scandals have “fuelled” the press, social networks, television, and radio, and have also found their way to our plates in the last 15 years. All of these many years of eating these “foods” have led us to travel and find “culinary gems” and persuade ourselves that there are still responsible producers, who love fine food and above all FLAVOUR! So what are you waiting for, visit the “Our Producers” section to see them all! The fact that we have been able to find such authentic products is quite simply because we have been working with brands which have existed for, often, over 50 or 100 years which are relatively unknown but still so enthusiastic about the idea of promoting their expertise to consumers. But, also, because the supply channels for raw materials are perfectly managed and sometimes even integrated in-house. Some of our suppliers even have their own almond fields, own herb and spice gardens, or soya fields in order to control the entire supply chain as far as the end product. This has allowed us, today, to introduce you to authentic stakeholders who are committed to offering high quality products which we hope will be increasingly consumed on a daily basis. At ecolive.fr, organic certificates, photos and videos of production plants are all available and explained in a fully transparent manner, so as you can visit organic stores or groceries in total confidence. So come and read our blog and producer pages!